Author’s acknowledgment: I am a 47-year-old white, middle-class woman. I live on land that was once stewarded by the Pomo peoples with whom I have little current direct relationship except through the prayers, offerings, and visions that I receive. It is a tremendous privilege and responsibility to be involved in the experiment of intentional community and how to transition land into seventh generation stewardship. Just about every aspect of the human project needs our attention now as the ecological and social crises of our times intensify. My attention is focused on how we can reimagine and experience our relationship with the land as communities of place-based people. Professionally, I have been a real estate agent for the last 13 years providing agency and consultation to groups and individuals. Personally, I have cofounded two intentional communities and a community land trust. These threads weave together in my passion and purpose as an activist, consultant, and educator in service to the transition from private property to cooperative stewardship. This transition is occurring in a myriad of forms right now, ranging from small-scale family farms to various sizes of intentional community, a growing community land trust movement, and even national-scale movements integrating land trusts, new types of real estate cooperatives, and a vibrant indigenous- and POC-led movement to counterbalance the great economic and racial injustices of our times. Intentional communities are positioned to help the world answer some of the most vexing and crucial questions of our times. Many of us are asking ourselves questions about what we own privately, what we steward as a group, and how we make decisions about all of this together. These are especially potent agreements to navigate with regard to land and home. In our humble little or audaciously large experiments, we often come to the intentional-community table with the economic disparities of the system we were born into, putting conversations of equity, security, power, and legacy in the center of our circle to support and create the transition into a future that is healed of the territorial wars of the past. Private and divided, our culture and the private lands upon which we live can reflect us as a privately broken and divided people. Community land is the place where the fabric begins to mend, and the land and the people can heal together. We arrive at that table with the great injustices of our times both as problems to address collectively and as personal circumstances that vary greatly. These include economic disparity, white privilege, differences in emotional experience, nervous system regulation, and spiritual beliefs. How much we have done “our work” or have just been surviving? And here we are at the round table of collective decision making. Doing this world work is no small task. Luckily, as we address these huge internal and external challenges, we have the land itself to turn to for guidance and support. One of the most obvious and most pressing inquiries is simply to ask the question: “Who owns the land?” We must ask ourselves this question as we seek to discover the power and privileges that come with land ownership. I know firsthand that it can be very challenging as a private property owner to stand back and look at our circumstance with a wider lens. In capitalism, ownership has conferred to us an experience of security, power, rights, and the ability to accumulate and extract value from land. In stewardship, we realize that what we call ownership is actually a humbling and great responsibility. Many well-intentioned projects are distorted and weakened at their base because they have neglected to work out a pathway for “ownership” for members. Unpacking this idea of ownership a bit, we can see that what people usually need is security, equity, and agency. Ultimately, we must pull apart the concepts that are bundled into the legal fiction we call private property ownership and address the questions of power, responsibility, equity, security, and legacy. Corrina Gould is a cofounder of the Sogorea Te Community Land Trust, an urban, indigenous, women-led community organization that facilitates the return of Chochenyo and Karkin Ohlone lands in the San Francisco Bay Area to indigenous stewardship. She reminds us that the question of who owns the land is a colonial question. Settlers introduced that idea to indigenous peoples. Other questions we can ask are: Who is responsible for this land? Who is in deep relationship with this land? Who is listening to this land? What is the history and seventh generation legacy of this land? These questions do not lead us to private property rights. They lead us to cooperative stewardship. How do we create council-based stewardship of land that will last and renew itself many lifetimes beyond ours? How can our community land trust boards and our intentional community governance agreements become indigenously-informed stewardship circles? We must listen to indigenous wisdom. And…we live in an era of unbridled technology, and our modernized experience must be woven with our histories to create a future that is beyond the territorialism that has been part of the human experience with land through history. Our indigenous ancestors fought over land and territories, but they didn’t possess the technology that could destroy so much life. We now do. Our “exponential technologies” have taken us to the limits of the earth’s resources, threatening so much of life on earth. Daniel Schmachtenberger of the Collective Insights podcast lays it bare in his analysis of all of this and brings it down to the equation exponential technology + finite resources + rivalry = destruction of civilization. This pattern has played itself out throughout human history on smaller scales, and now the stakes are as high as they have ever been. Robert Gilman of the Context Institute describes three eras of human history: Tribal, Empire, and Planetary. His perspective and analysis compel us to see that we are at the end of Empire. We must steward forth the Planetary era in which our technologies have connected us worldwide. Our understanding of the biosphere and our human impact is at hand, and we must transition from the view of the planet as ownable by private interests. Fighting over land and the power it conveys is the basis of the rivalry that we humans must address immediately. Private property cannot be the basis of the Planetary Era. The idea and the institution of private property—this dinosaur of legal fiction that some of our ancestors created—often seems too big to tackle…and yet we must. Communities are in a position to lift up the stories that show how we are putting the land back into the commons and sorting out how to live together in non-rivalrous, cooperative governance systems. One beautiful way of looking at this is to see that we are doing the work of weaving three story threads together. In her book If Women Rose Rooted, Sharon Blackie (who is of Celtic ancestry) describes these three threads in the following way: The first thread is our own indigenous ancestries from wherever our bloodlines have traveled across the planet. Sharon suggests that we do what we can to learn the stories of the land and the people from whence we came. The second thread is the stories of the land where we live and our place ancestors. We must come to know and respect the stories of the people and the land below our feet. The third thread is the story of how we are weaving the first two threads together in what we are doing to restore intimacy with the land in the places we live. In a podcast interview Sharon asked Pat McCabe (Woman Stands Shining, Diné) one of the big questions of our time: How do white settlers find their stories of the land in a place where stories are populated by another people? How do people in America find our own stories so we don’t appropriate yours? While acknowledging that there is great reason to be sensitive to appropriation, Pat responded that it is the birthright of all of us to call out to Mother Earth. She says that while indigenous cultures have maintained relationship with Mother Earth and the Cosmos along well-worn trails, we can still bushwhack our way up the mountainside. That process might lead to dead-ends or dangerous places, but we have to work it out. When asked how to recreate a relationship with the land, Pat suggests to go out in the morning to your altar and be in the songs. You have a right to do that. Somehow each of us must go out to the land and make our offerings and begin to listen, and together as communities we must learn that the way forward into the planetary era beyond private property will also depend on how well we can do this together. We have much to learn, but the movement is afoot and the land is holding the stories of both our brokenness and our wholeness. I went down to the great California Bay Laurel tree that sprawls magnificently at the property line where the creek flows onto the land I co-steward. The barbed wire used long ago has now been completely engulfed by one of the many trunks of this tree and dangles out of the center of the trunk. We call her Wholly Tree because she is Holy, and Hole-y, and her long life now presents with every life stage from sprout to ancient cavernous snag. She is one of our medicine trees, and I turn to her for advice. 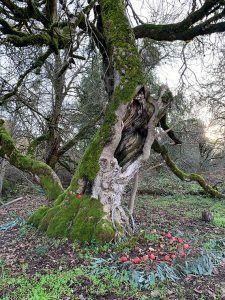 Cassandra Ferrera lives with her family at Landwell in Sebastopol, California, which is a new land-based community of 26 people on 22 acres committed to healing and restoring our sacred relationship with place. She is an educator, activist, and consultant dedicated to cooperative stewardship. Cassandra serves on the Board of the Fellowship for Intentional Community and also of CommonSpace Community Land Trust and her real estate license is with Green Key Real Estate. Her website is www.cassandraferrera.net.